After being under Spanish rule since the 16th century, Mexico finally detached from Spain in 1821 to become a Central American state. Their flag, also designed in 1821, paid homage to France, whom Mexico admired for its dedication to freedom. 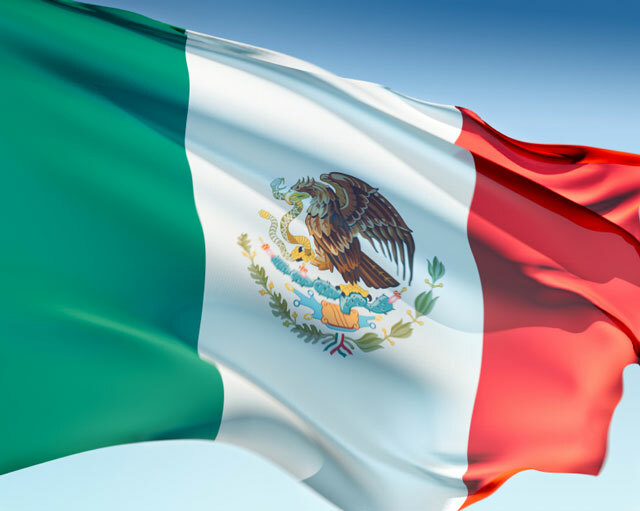 The original Mexican flag was indistinguishable from the current Italian flag, though Italy's flag wasn't in use at the time the Mexican flag was adopted. The design was based on the French tricolore, and featured vertical bands of green, white, and red. 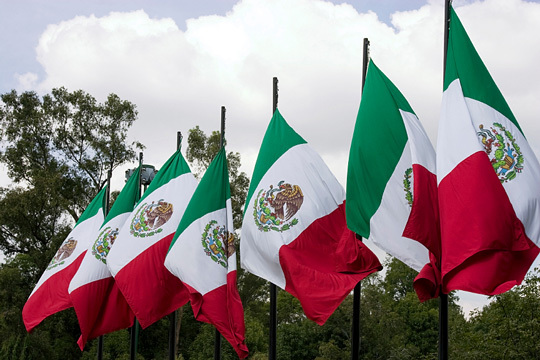 These colors were chosen because they represented those of Mexico's national liberation army. A coat of arms was eventually added to the center of the white band in order to distinguish the flag from that of Italy. The coat of arms incorporates the badge of Mexico City, and recalls a legend that explains how the Aztecs decided to settle on what was originally a lake-island. The ribbon on the coat of arms represents the national colors. From the sandy deserts and mountains of the northern regions, to the sprawling capital city, to the tropical beauty and tourist areas along the southern and eastern coasts, Mexico is a nation of contrasts. With the exception of Baja California, which draws wealthy tourists to its Pacific beaches, much of northwestern Mexico is dominated by arid landscapes and accompanying poverty. The prosperous business centers of Monterrey and Guadalajara border this region to the east and south, respectively. The Sierra Madre Occidental and Sierra Madre Oriental mountain ranges make twin slashes from north to south across the map. At the southern end of the Sierra Madre Oriental range, snow-capped Pico de Orizaba, the tallest mountain in Mexico and third-tallest in North America, rises to over 18,000 feet. One-hundred twenty miles to the west, in the heart of Mexico, is the bustling urban center of Mexico City. With around 20 million people, it is one of the largest cities in the world. Home to many international corporations and a diverse population, the metropolis is by far the most cosmopolitan of Mexican cities. Not far from here are the ruins of Tenochtitlan, the ancient center of the Aztecs. Massive pyramids, broad stone plazas, and crumbling walls bear witness to a powerful, technologically-advanced, but also cruelly ritualistic civilization. To the south, the Sierra Madre del Sur mountain range divides the lush, tropical southern coast from the rest of Mexico. Resort towns and historical sites such as the colonial city of Oaxaca draw tourists. With its history and natural beauty, the Yucatan Peninsula is one of the major tourist draws of Mexico. Mayan ruins such as Chichen Itza, one of the seven modern wonders of the world, are scattered throughout its tropical rainforests. Along the eastern shore, tourists crowd the gorgeous sand beaches of Cancun, Playa del Carmen, and other resort centers. Centuries-old mansions, churches, and fortress walls, the remnants of Spanish colonization, still stand in Campeche, located on Mexico's western shore. Culture ties the varying regions of Mexico together. The family is central to society. Catholic tradition dominates in much of society, a remnant of Spanish colonization. Together with a rising Protestant population, it comprises the vast majority of religious faith in Mexico. Much of the population is of Spanish, Mayan, and Aztec mixed descent. While many indigenous languages are still kept alive, Spanish is commonly spoken and understood throughout the country. All of these common bonds serve to bring together this diverse nation as a unified whole. Mexico Facts - information about Mexico and its flag. Mexonline.com - general information and news about Mexico. Mexico Map - Mexico maps, geography, and tourism. Mexico News - news articles and facts about Mexico.